Modern Day Slavery is a 32 billion dollar industry. Americans will spend 16 billion dollars this year on Valentine's Day. Rebel against consumerism and take back Valentine's Day for love and hope. Swing to the sounds of the Franklin Micare Trio. Indulge in rich desserts and coffee. Imbibe fine wines and craft beers from Brown's Brewing. Enjoy a justice and mercy themed raffle. All to benefit Love 146. 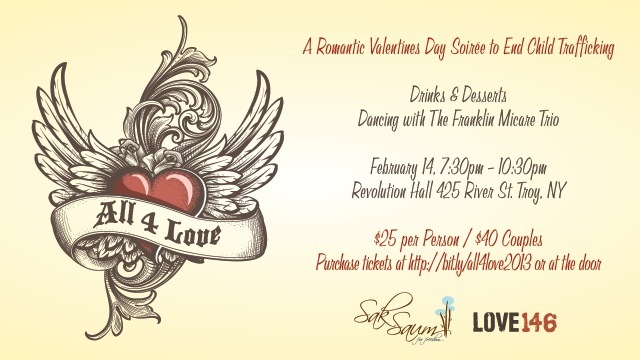 Join me on February 14th and make this your Valentine's Day event! More information about Love 146 can be found at love146.org.